Kale is a green leafy vegetable belonging to the cruciferous family, the same family as cabbage, Brussels sprouts and broccoli. It has a cult-like status among many vegetarians and vegans and is often seen as the cornerstone of their nutrition. We know better of course and while we can appreciate the nutritious value of kale, we know very well that it’s not the holy grail either. Like many green leafy vegetables, kale is a great source of vitamin K, vitamin C, manganese, calcium and copper. It’s also a great source of beta-carotene, which can be converted to the usable vitamin A, but the conversion is very poor for most humans. Also like most other green leafy vegetables, the nutrients in kale are harder to absorb when the vegetable is eaten raw. Eating kale with some fat will also help with the absorption of fat soluble vitamins like vitamin A, E and K. Quite the opposite of what a raw vegan would think of as healthy! Although very nutritious, we have to keep in mind some properties in kale that might make it less desirable for some people or in greater amount. For example, kale is a source of oxalates, which can be a problem for those who suffer from kidney or gallbladder stones. Kale, like other vegetables of the cruciferous family, is goitrogenic, which means that is can hinder the uptake of iodine by the thyroid gland, which can be bad news if you’re already deficient in iodine or if you have thyroid problems. Conventionally produced kale is also often the source of pesticide residues in high levels. It has been placed by the Environmental Working Group in the top 12 foods where pesticide residues are most commonly found. It’s therefore much better to enjoy kale when in-season and locally produced. Fresh, local and organically produced kale will also taste much better and will contain much higher levels of some nutrients like vitamin C and vitamin E.
For the reasons mentioned above, it’s better to rotate between a large variety of vegetables and not overdo any green leafy vegetable. Enjoy kale sporadically instead of daily and your body will receive all the benefits from the large amount of nutrients and none of the drawbacks from the compounds that can be toxic in high dose. Kale chips are a classic snack for those trying to lose weight by limiting calories, but most people on a paleo diet prefer to enjoy them simply because they are delicious. Nothing beats the slightly salty taste and crunchy texture of this simple paleo snack. The following kale chips recipe is very simple and will be ready in no time so you can enjoy this snack whenever you feel like it. You can take this basic recipe and add to it with some of your favorite spices. Cayenne pepper is a good choice for those who like a bit of heat. Some people like to prepare kale chips in a dehydrator, they are as great when baked. 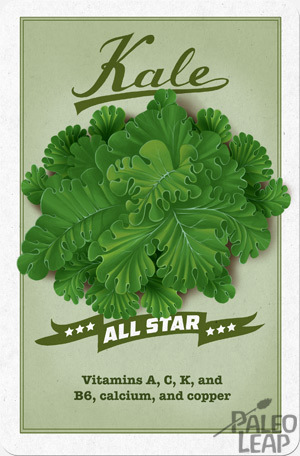 Wash the kale thoroughly under lukewarm water, drain and pat it dry. Cut the stems off of the kale leaves and cut the leaves to obtain chips of similar size. Place the kale in a bowl and massage the melted cooking fat into them. Season to taste with sea salt and freshly ground black pepper. Add the lemon juice and combine well. 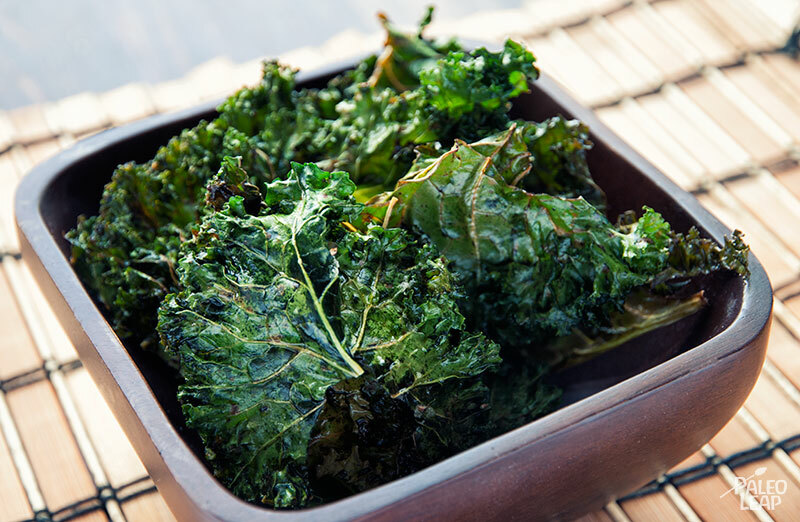 Place the kale in a single layer on a baking sheet and place in the preheated oven for about 35 minutes, until crispy. Check on the chips about every 12 minutes and toss them to make sure none of them overcook. Some parts will still be soft and this is desired. Sprinkle with extra sea salt if desired and enjoy.